Rosemary Kirstein’s remarkable book, The Steerswoman, exists in the place between science fiction and fantasy. It looks like a fantasy novel, and uses the familiar story of an improbable band of heroes on a quest through a fantasy kingdom as a backdrop, but its core is made of the hardest science fiction. The underlying story of The Steerswoman is about the triumph of science and the human will over superstition and elitism. I like nothing better than a book that plays with genre and a protagonist who wins by being smart. The Steerswoman does both, and does them well. Kirstein’s straightforward writing lets her ideas and her characters dominate the story. One of my favorite aspects of this book is the friendship between the two main characters. Rowan, the eponymous Steerswoman, is a member of an order of traveling map-makers. A Steerswoman’s job requires her to answer any questions asked of her, provided that her questioner is willing to answer any questions she asks in return. Refusing to answer a Steerswoman’s questions or lying to a Steerswoman puts an individual under a permanent ban — no Steerswoman will answer their questions ever again. Steerswomen (there are some Steersmen, but only a few, due to most men being uninterested in learning the necessary skills) are trained to investigate anything that catches their attention using a system of data gathering and hypothesizing. They are, effectively, an order of scientists. Kirstein avoids turning Rowan into an unapproachable Holmes-type character by keeping her chains of inductive logic clear, avoiding absurd over-generalizations, and allowing her to be wrong. Rowan wants to help people, and that makes her an easy character to root for. Bel, on the other hand, is a warrior. Born on the extreme edge of civilization, she walked into Rowan’s world for the sake of seeing something new. She meets Rowan in a tavern (a very familiar fantasy story, as I said). Her skill as a warrior is not only reflected in the way she fights, but in her outlook on the world, and makes her a perfect foil for the Steerswoman. Their friendship, born out of mutual respect, is simply a pleasure to watch as it grows. The Steerswoman is constantly winking at its audience. The characters behave as if they were living in a fantasy novel, but an astute reader will quickly recognize what the “magic” that the wizards use really is. While this might annoy some readers, I found it charming. I also found that The Steerswoman only improves upon rereading. For me, knowing why a wizard might not want his spells jostled or placed too close to a fire only increases the drama of the situation. I will add one caveat to my otherwise wholehearted recommendation of The Steerswoman: While this book comes to a satisfying conclusion (with one of the best do-your-worst speeches I’ve read in a long time), it does not resolve all of the mysteries. The sequel, The Outskirter’s Secret, answers many of the questions left hanging at the end of The Steerswoman, but it also isn’t the end of the series. As far as I know, the end of this series has not yet been written. I cannot blame readers who pass over The Steerswoman for that reason; however, I do think they’re missing out. The first two books are currently available in one volume, called The Steerswoman’s Road. Too much science fiction glorifies mere scientific fact and appeals to scientific authority. Such books are doomed to obsolescence as the state of the art passes them by. Rosemary Kirstein’s books, in contrast, are made timeless by their emphasis on the process of science, which anyone can do. 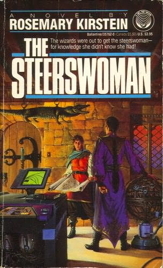 The Steerswoman is a fun work of fantasy fiction with dragons, sword fights, and magic — and also a well-honed work of science fiction, demanding to know the answers to hard questions and the logic behind the magic. The Steerswoman lets the reader watch as the characters use the scientific method to discover the true nature of their world. I cannot recommend this book, and its sequels, highly enough.